(13 percent) of forests, nearly all to urban uses. 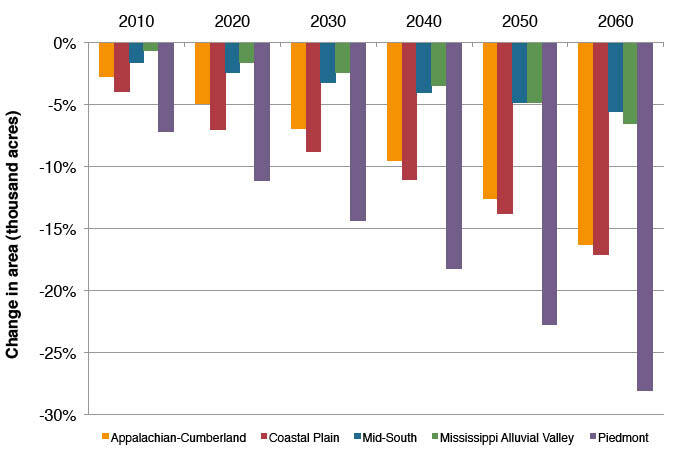 All of the South’s five subregions are expected to lose at least some forest acreage under all evaluated futures. Land use patterns define both the extent of human presence on a landscape and the ability of land to provide a full range of ecosystem services. The future sustainability of forests in the South has been and will continue to be largely influenced by the dynamics of land use. And as the region’s population grows so too will the area of developed uses. The pattern of these developments, returns from the various products of rural land, and the land’s inherent productivity will determine the distribution of forest, crop, and other rural land uses, and therein the structure and function of terrestrial ecosystems (Chen and others 2006, Wear 2002). The purpose of this chapter is to examine how land use could respond to the economic and population forecasts associated with the Cornerstone Futures for the Southern Forest Futures Project. Our forecasts use empirical models to address the Cornerstone Futures and to examine some specific questions about alternative land use futures. Land use forecasts play a central role in the U.S. Forest Assessment System (Wear and others 2013), with the information developed in this chapter providing one of the inputs to the Forest Assessment System’s forest dynamics model, which in turn generates forecasts of southern forest conditions (chapter 5). In addition, land use and forest forecasts feed additional analyses in the Futures Project, including analyses of timber markets (chapter 9), water (chapter 13), wildlife and biodiversity (chapter 14), and fire (chapter 17). 13 States in the Futures Project’s analysis area except for central and western Texas and Oklahoma, where results derive from the land use model developed for the Rocky Mountain/Great Plains region. Each land use model has two major components: changes in county-level population and personal income, which are used to simulate future urbanization; and allocations of rural land among competing uses that are likely to result from predicted urbanization and rural land rents. Output from both components is based on land use data from 1987 and 1997 to ensure that forecasted land use changes are generally consistent with observed urbanization intensities and rural land use changes (Wear 2011). The land use model for the South is driven by county-level changes in population density, personal income, and timber and crop prices. In comparison, land use change in the Rockies/Great Plains model is sensitive only to changes in population and income, and with changes in rural land uses forecasted to be proportional to their 1997 levels. Because tree planting following harvest does not alter total land use projections, the projections developed in this chapter are limited to Cornerstone Futures A through D (with Cornerstone E having forecasts equivalent to Cornerstone A, and Cornerstone F having forecasts equivalent to Cornerstone D). Observations of historical land uses were derived from the 1987 and 1997 surveys conducted by National Resources Inventory, which provides the only consistent, repeated, and exhaustive measures of all non-Federal land uses. Uses include pasture, crops, forest, range, or urban uses (which includes both urban and lower density developed areas); they cumulatively define the total “mutable” land for modeling change in the South (table 4.1). Other land use categories—including Federal land, water area, enrolled Conservation Reserve Program lands, and utility corridors—were held constant within the forecasts. We applied the population and personal income projections for the two RPA storylines (A1B for Cornerstones A and B; B2 for Cornerstones C and D) to drive forecasts of urbanization. The A1B population forecasts are based on 2004 Census projections for the entire country; B2 population forecasts are lower than the Census projections. 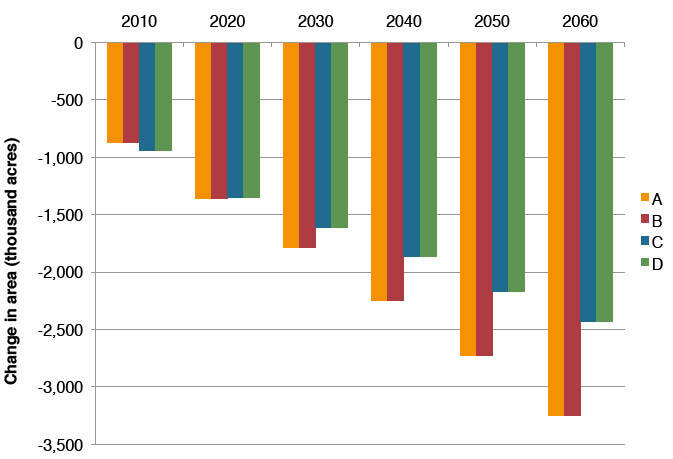 Zarnoch and others (2010) developed county-level projections for each scenario; their projections are tied to spatial econometric/demographic forecasts (Woods and Poole Economics 2007) that are generally consistent with the A1B projection for 2000 to 2030. County-level projections for A1B were disaggregated by extending 2000–30 patterns of growth from the Woods and Poole projections (Zarnoch and others 2010). Projections for B2 applied the same spatial pattern of population change, but were adjusted to yield county-level projections that added up to the storyline’s total (chapter 2). A1B corresponds to mid-range population growth and the highest per capita disposable personal income level of the RPA storylines (chapter 2). Under this storyline, the South can expect to see about 160 million people and a per capita personal income of around $80,000 (2006 dollars) by 2060. B2 projects a lower population growth and lower personal income, predicting a population of 143 million people with per capita personal income around $60,000 in 2060. A third storyline, A2 was used in the RPA analysis, but was not selected for use in the Forest Futures analysis (chapter 2). A fourth storyline, B1, was not included in either the RPA or the Forest Futures analysis because of data compatibility issues. Population is not forecasted to grow evenly across the South. Rather, projected growth is concentrated on a number of existing urban centers. 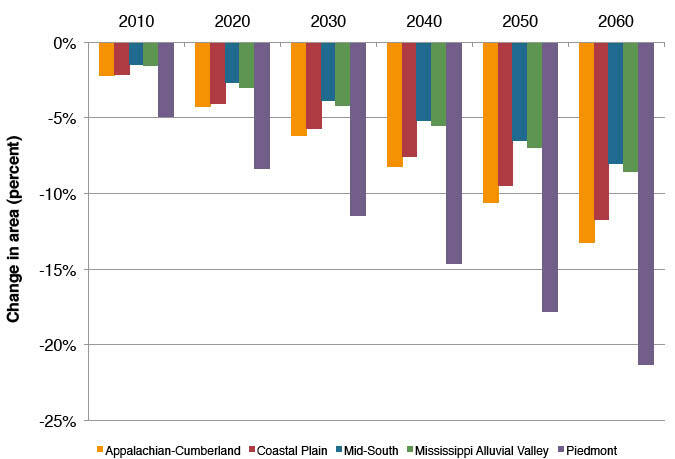 In addition, population declines are forecasted for many counties (chapter 2). Population loss is expected to be especially high in the Great Plains portions of Texas and Oklahoma, the Mississippi Alluvial Valley, and southern Alabama and Mississippi. Timber price projections also vary across the Cornerstone Futures. Cornerstones A and C assume increasing prices while B and D assume decreasing prices. The land use model for the South is sensitive to these changes in prices. Increasing timber prices (relative to crop prices) encourages higher retention of forest land than price decreases. For all the Cornerstone Futures, the price of crops was held constant at current (2006) values. Percent coverage of the five land uses for non-Federal land (table 4.1) in 1997 are individually shown at the county level in figure 4.1 and are compared for the region as a whole in figure 4.2. Patterns of rural uses reflect biome boundaries and differences in productivity that are in turn affected by biophysical conditions. 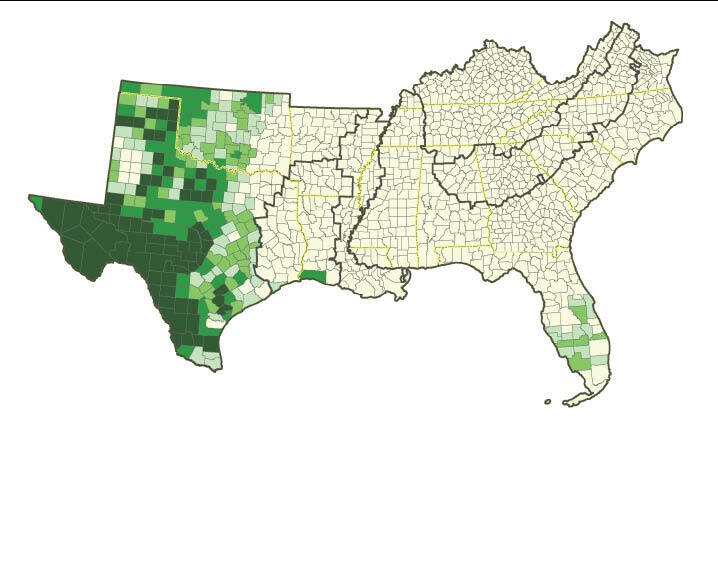 Figure 4.1 shows that forest uses are predominant across much of the South, cropland is concentrated in the Mississippi Valley and in northwest Texas (with areas of moderate concentration in the upper Atlantic Coastal Plain and along the Gulf of Mexico in Texas and Louisiana), range is concentrated in the High Plains area of West Texas, and pasture is sparse across the South (with the exception of the Cross Timbers area of eastern Texas and Oklahoma, the Cumberland Plateau, and the Blue Ridge Mountains). Figure 4.1 also shows that Dallas, Houston, Miami, and Atlanta are the most densely developed urban areas in the South; and that the Southern Appalachian Piedmont and Peninsular Florida are experiencing broad areas of moderate urban density. The county-level scaling of these maps masks the distribution of small urban areas in large counties and suburban and exurban sprawl into some counties adjacent to metropolitan areas. (-13.1 percent) for forest uses, and from about 5 million acres (-6 percent) to about 16 million acres (-19 percent) for cropland uses (fig. 4.4). In the following sections, we examine these changes in detail, organized by land use category. 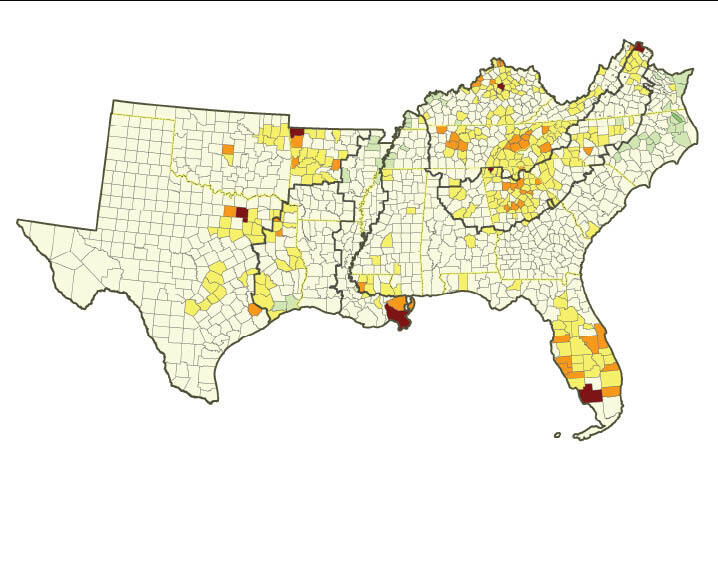 Figure 4.2—Distributions of non-Federal land uses in the South, 1997 (reflecting the National Resource Inventory definition of mutable land base for total land in the South). Figure 4.3—Changes in urban, forest, cropland, range, and pasture land uses for each of four Cornerstone Futures: (A) large urbanization gains with increasing timber prices, (B) large urbanization gains with decreasing timber prices, (C) moderate urbanization gains with increasing timber prices, and (D) moderate urbanization gains with decreasing timber prices. Figure 4.4—Forecasted distributions of non-Federal land use, 2060, for four Cornerstone Futures: (A) large urbanization gains with increasing timber prices, (B) large urbanization gains with decreasing timber prices, (C) moderate urbanization gains with increasing timber prices, and (D) moderate urbanization gains with decreasing timber prices. A land cover/use that is at least 10 percent stocked by single stemmed forest trees of any size that will be at least 4 m (13 feet) tall at maturity. When viewed vertically, canopy cover is 25 percent or greater. Also included are areas bearing evidence of natural regeneration of tree cover (cutover forest or abandoned farmland) and not currently developed for nonforest use. For classification as forest land, an area must be at least 1 acre and 100 feet wide. A land cover/use category that includes areas used for the production of adapted crops for harvest. Two subcategories of cropland are recognized: cultivated and noncultivated. Cultivated cropland comprises land in row crops or close-grown crops and also other cultivated cropland, for example, hayland or pastureland that is in a rotation with row or close-grown crops. Noncultivated cropland includes permanent hayland and horticultural cropland. A land cover/use category on which the climax or potential plant cover is composed principally of native grasses, grasslike plants, forbs or shrubs suitable for grazing and browsing, and introduced forage species that are managed like rangeland. This would include areas where introduced hardy and persistent grasses, such as crested wheatgrass, are planted and such practices as deferred grazing, burning, chaining, and rotational grazing are used, with little or no chemicals or fertilizer being applied. Grasslands, savannas, many wetlands, some deserts, and tundra are considered to be rangeland. Certain communities of low forbs and shrubs, such as mesquite, chaparral, mountain shrub, and pinyon-juniper are also included as rangeland. A land cover/use category consisting of residential, industrial, commercial, and institutional land; construction sites; public administrative sites; railroad yards; cemeteries; airports; golf courses; sanitary landfills; sewage treatment plants; water control structures and spillways; other land used for such purposes; small parks (< 10 acres) within urban and built-up areas; and highways, railroads, and other transportation facilities if they are surrounded by urban areas. Also included are tracts of < 10 acres that do not meet the above definition but are completely surrounded by urban and built-up land. Two size categories are recognized in the NRI: (1) areas a quarter of an acre to 10 acres, and (2) areas > 10 acres. Figure 4.5—Change in urban land uses for the South, 1997 to 2060, under four Cornerstone Futures: (A) large urbanization gains with increasing timber prices, (B) large urbanization gains with decreasing timber prices, (C) moderate urbanization gains with increasing timber prices, and (D) moderate urbanization gains with decreasing timber prices. Figure 4.6—Percentage change in urban land uses, 1997 to 2060, based on an expectation of moderate urbanization gains with increasing timber prices (Cornerstone C). 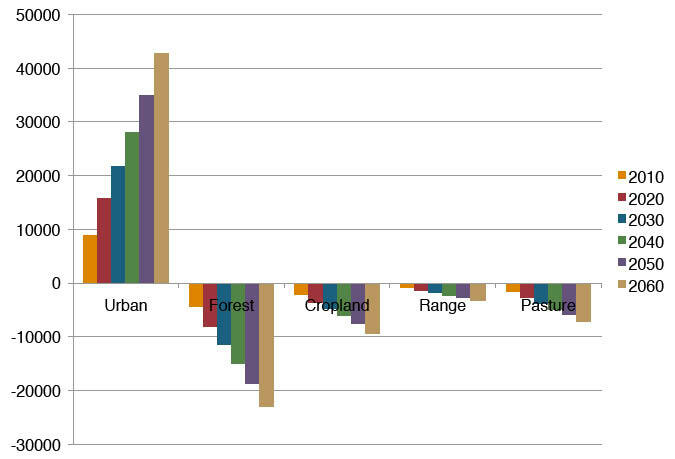 Figure 4.7—Percentage change in urban land uses, 1997 to 2060, based on an expectation of large urbanization gains with increasing timber prices (Cornerstone A). Figure 4.8—Cumulative change in urban area by southern subregion from 1997 to 2060 by decade, expressed in (A) acres and (B) percent; based on an expectation of large urbanization gains, either with increasing timber prices (Cornerstone A) or with decreasing timber prices (Cornerstone B). Figure 4.9—Cumulative change in forest land uses by southern subregion from 1997 to 2060 by decade, expressed in (A) large urbanization gains with increasing timber prices, (B) large urbanization gains with decreasing timber prices, (C) moderate urbanization gains with increasing timber prices, and (D) moderate urbanization gains with decreasing timber prices. By model construction, urban forecasts are driven exclusively by population and income forecasts and are not influenced by the future trajectory of timber or agricultural prices. Cornerstones A and B (with the A1B storyline) have the same higher rates of income growth and population growth. The result is an expansion in urban uses of about 43 million acres (about 143 percent) by 2060 from the 1997 base of about 30 million acres (table 4.2 and fig. 4.5). Cornerstones C and D (with the B2 storyline) have lower rates of income growth and population growth, with a resulting gain in urban uses of about 30 million acres (98 percent) over this same time period (table 4.3). Urbanization is highest in areas experiencing the highest population growth (chapter 2); for the South, this growth is at the periphery of urban centers (fig. 4.6). For Cornerstones C and D, gains in urban uses are widespread with the exception of the few areas expected to experience population declines (such as the Mississippi Alluvial Valley and southwestern Alabama). For Cornerstones A and B (fig. 4.7), urbanization spreads out across an even broader area, highlighting its dependence on increases in income. 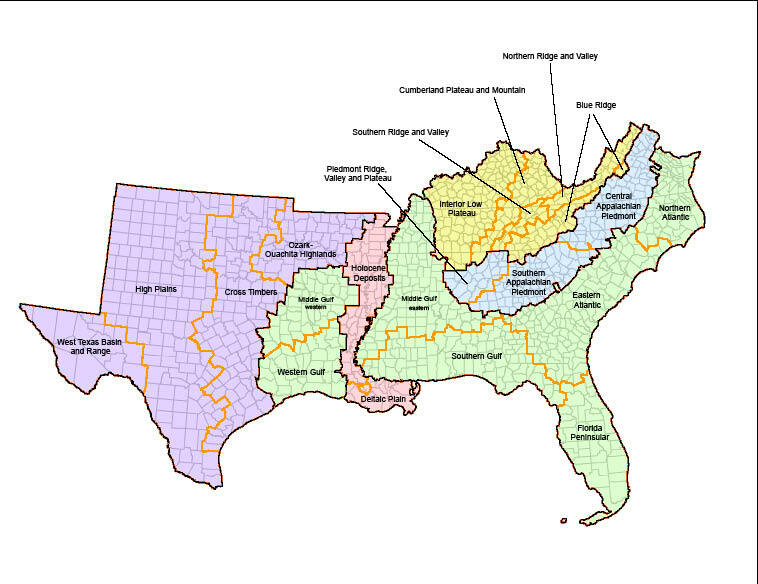 The amount of urban growth varies across the South’s five subregions (fig. 4.8 and table 4.2 for Cornerstones A and B; table 4.3 for Cornerstones C and D). Under Cornerstones A and B, almost 18 million of the 43 million acres of additional urban area is on the Coastal Plain. The Piedmont and Mid-South add about 9 million acres each, the Appalachian-Cumberland adds about 7 million acres, and the Mississippi Alluvial Valley is last with a comparatively small increase. The Appalachian-Cumberland has the highest growth rate, adding about 175 percent to its relatively small 1997 urban base; fastest growing sections are in central-northern Kentucky (an area bordered by Lexington, Louisville, and Cincinnati, OH) and in areas around Nashville and Knoxville in Tennessee. Growth rates for the other four subregions range from 125 to 140 percent. acres (13 percent) by 2060 for Cornerstone B, which is based on high economic growth (storyline A1B) and declining timber prices (fig. 4.9). At the other end of the spectrum is a projected loss of about 11 million acres (7 percent) for Cornerstone C, which is based on low economic growth (storyline B2) and increasing timber prices. 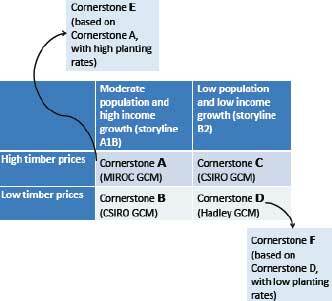 Comparing forecasts for Cornerstones A and B with those for Cornerstones C and D shows a 5-million acre difference between a future of increasing timber prices and a future of decreasing prices, confirming that the effects of the economic/population storyline dominate the effects of timber prices. Forest losses are especially high in a few areas of the South (tables 4.4 and 4.5). 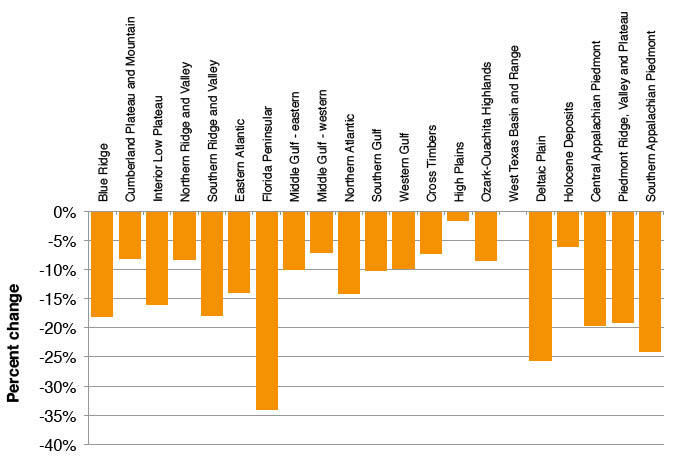 For all Cornerstone Futures, losses are concentrated in the Piedmont from northern Georgia through North Carolina and into parts of Virginia, as figure 4.10 shows for Cornerstone C (selected because it is bracketed by the other Cornerstones). Other areas of concentrated forest losses are on the Atlantic Coast, along the Gulf of Mexico, and in parts of eastern Texas outside of Houston. The income-fueled development in Cornerstones A and B spreads low-intensity forest losses across a broader area (fig. 4.11). 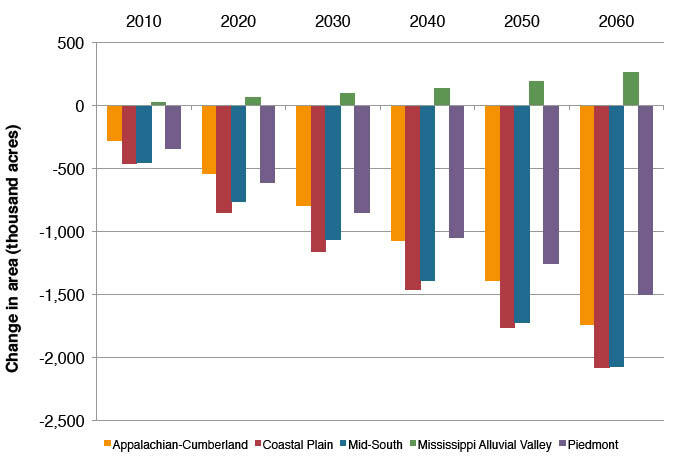 Under Cornerstone B, forest losses are highest in the Coastal Plain, at about 12 million acres by 2060, and lowest in the Mississippi Alluvial Valley and the Mid-South (fig. 4.12). Percentage losses are greatest in the Piedmont, where 21 percent of existing forests would be lost, followed by an Appalachian-Cumberland loss of 13 percent and a Coastal Plain loss of about 11 percent. Figures 4.10 and 4.11 show changes in the percentage of each county that is in forest cover to enable ready comparisons across counties of variable size. If instead we examine the percentage change in forest, then different information is conveyed. Figure 4.13 shows the percentage change in forest uses for Cornerstone C, where economic growth is low (storyline B2) but timber prices are increasing, to highlight areas where slight gains in forest are forecast in response to increasing timber prices (and stable crop prices)—most notably in central-western Kentucky and the Lower Mississippi Alluvial Valley. It also shows where the percentage loss of forests would be highest, with highest acreage losses generally at the periphery of urban areas such as the ring around Atlanta (fig. 4.10), and highest percentage losses at the core of these urban areas (fig. 4.13). This means that the percentage forest loss is highest where current populations is highest and where we might expect the aesthetic, recreational, and microclimate (cooling) services of forests to be most needed. 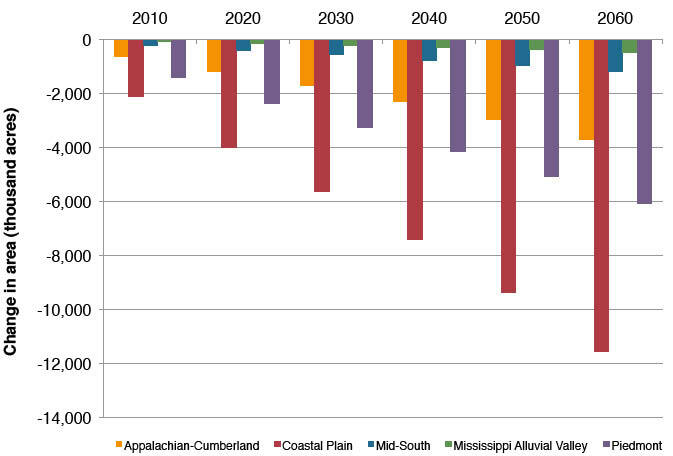 Figure 4.14 displays the loss of forest land by 2060 under Cornerstone B for each of the sections that comprise the South’s five subregions. All sections are forecasted to lose forests, with the highest loss (about 34 percent) expected for Peninsular Florida. The Deltaic Plain at the mouth of the Mississippi River is forecasted to lose about 25 percent, but this is from a very small 1997 base. All three sections in the Piedmont—Central Appalachian Piedmont, Piedmont Ridge Valley and Plateau, and Southern Appalachian Piedmont—would lose between 19 and 24 percent of their forest area. As with forest area, the change in cropland area depends on the economic conditions defined by each alternative future. However unlike forest area, which is dominated by urbanization patterns (driven by the A1B storyline), cropland change is more heavily influenced by the timber price futures. Losses range from about 16 million under Cornerstone A’s high economic growth (A1B) with increasing timber prices, to only about 5 million acres under Cornerstone D’s lower economic growth (B2) with decreasing timber prices (fig. 4.15). The difference in crop loss between storylines A1B and B2 (holding price futures constant) is about 3 million acres. The difference between increasing and decreasing price futures (holding storylines constant) is about 8 million acres. Cornerstone D, which predicts the lowest levels of cropland loss, shows especially high levels in North Carolina, southern Florida, central Kentucky and Tennessee, and the area in Texas bordered by Dallas, Houston, and Austin (fig. 4.16). Cornerstone A, where crop losses are highest (fig. 4.17), shows losses that are spread across broader areas of North Carolina, Tennessee, and Kentucky; and additional losses in southeastern Georgia and the coastal areas of Texas and Louisiana. 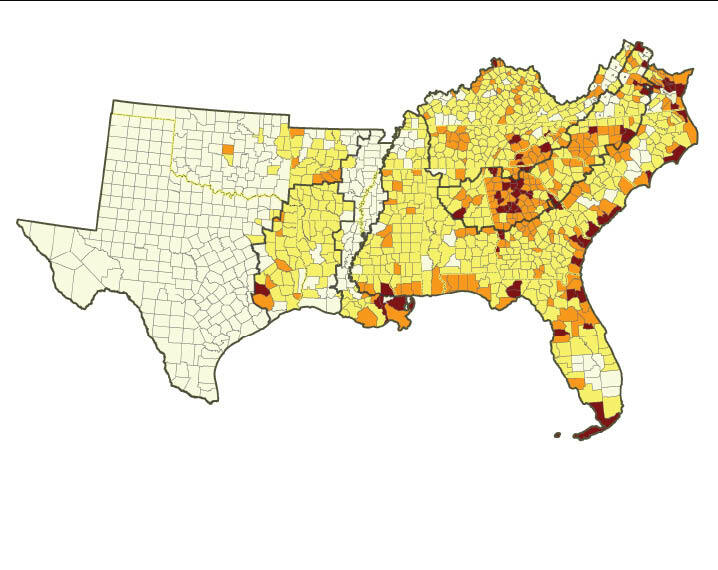 Among the five southern subregions, the highest percentage loss of cropland is in the Piedmont (28 percent under Cornerstone B and 51 percent under Cornerstone A), followed by large Coastal Plain and Appalachian-Cumberland areas (figs. 4.18 and 4.19). Pasture—The pattern of pasture losses across the Cornerstone Futures is similar to the pattern of forest losses. The highest loss is forecasted with Cornerstone B (about 7 million acres), and the lowest is forecast with Cornerstone C (fig. 4.20). Similar to the pattern of cropland forecasts, pasture area change is more heavily affected by timber price projections than by the economic growth forecasts. Pasture losses for all the Cornerstone Futures are concentrated in three broad zones: the first stretching from northern Georgia to northern Kentucky and including a large area of Tennessee, the second in Peninsular Florida, and the third including the Ozark-Ouachita Highlands and the Cross Timbers area of eastern Texas and Oklahoma. 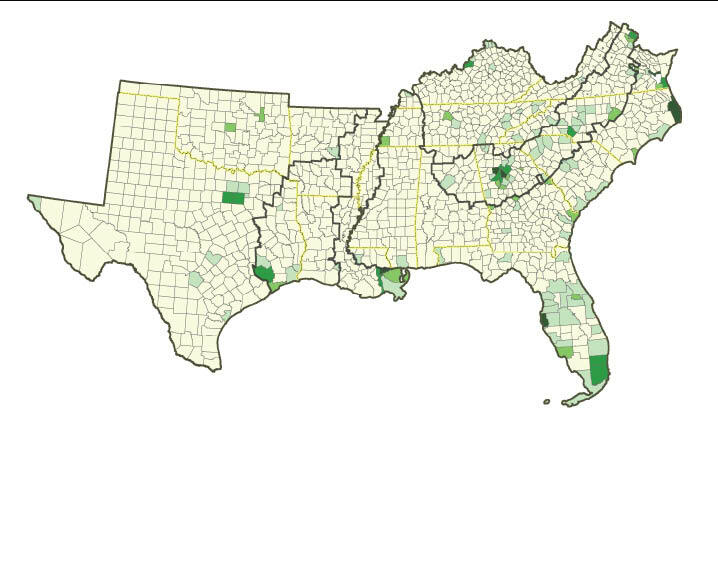 There is substantial variation across the five southern subregions. As is the case for forests and crops, the Piedmont has the largest percentage loss, about 25 percent for Cornerstone B (fig. 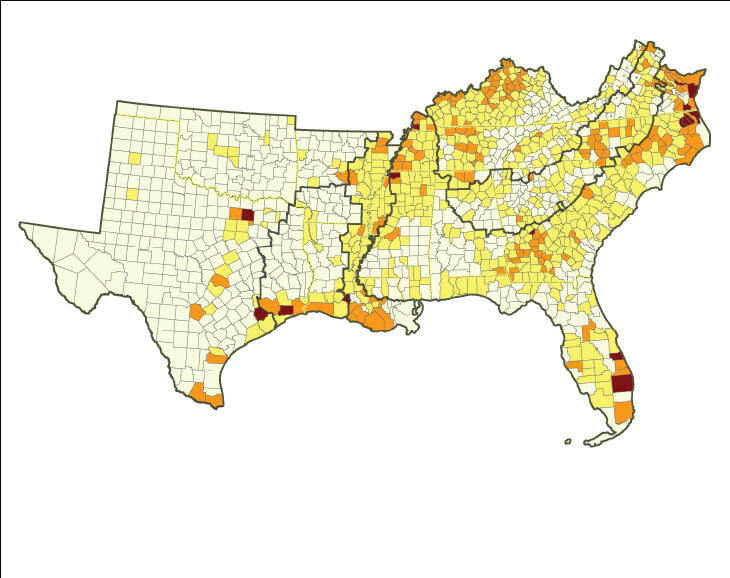 4.21), followed by Appalachian-Cumberland losses of 15 percent, Coastal Plain losses of 11 percent, and for the Mid-South losses of 9 percent (fig. 4.22). Rangeland—By construction, forecasts of change in range area are limited to Texas and Oklahoma and only reflect the effects of urbanization (not being sensitive to alternative futures for timber prices). Rangeland declines by about 2.5 million acres from 1997 to 2060 for Cornerstone Futures C and D and about 3.2 million acres for Cornerstones A and B (fig. 4.23). 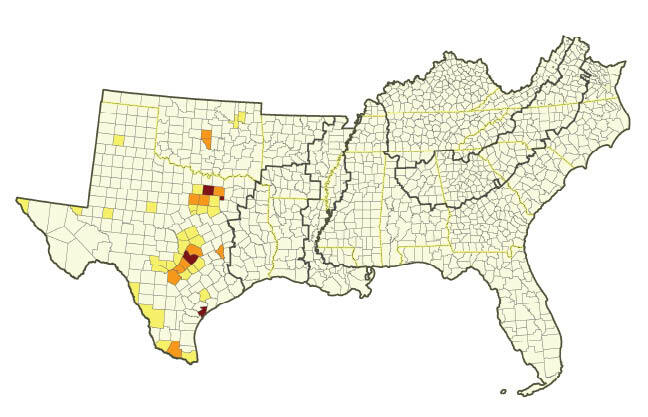 Rangeland losses are concentrated in the urbanizing Cross Timbers area of eastern Texas and Oklahoma, especially around Dallas and Austin, and along the border with Mexico (fig. 4.24). Figure 4.10—Percentage change in forest land uses, 1997 to 2060, based on an expectation of moderate urbanization gains and increasing timber prices (Cornerstone C). 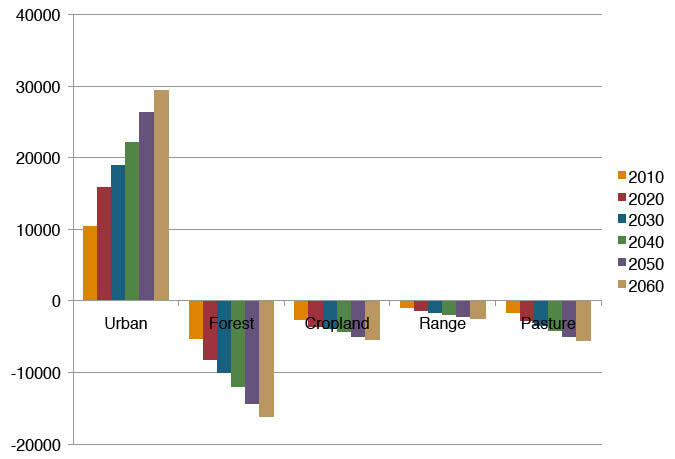 Figure 4.11—Percentage change in forest land uses, 1997 to 2060, based on an expectation of large urbanization gains and decreasing timber prices (Cornerstone B). Figure 4.12—Cumulative change in forest area by southern subregion from 1997 to 2060 by decade, expressed in (A) acres and (B) percent; based on an expectation of large urbanization gains with decreasing timber prices (Cornerstone B). Figure 4.13—Percentage change in forest land uses, 1997 to 2060, based on an expectation of moderate urbanization gains with increasing timber prices (Cornerstone C). Figure 4.14—Percentage change in forest land uses by southern subregion and section, 1997 to 2060, based on an expectation of large urbanization gains with decreasing timber prices (Cornerstone B). Figure 4.15—Cumulative change in cropland uses by southern subregion from 1997 to 2060 by decade, expressed in (A) large urbanization gains with increasing timber prices, (B) large urbanization gains with decreasing timber prices, (C) moderate urbanization gains with increasing timber prices, and (D) moderate urbanization gains with decreasing timber prices. 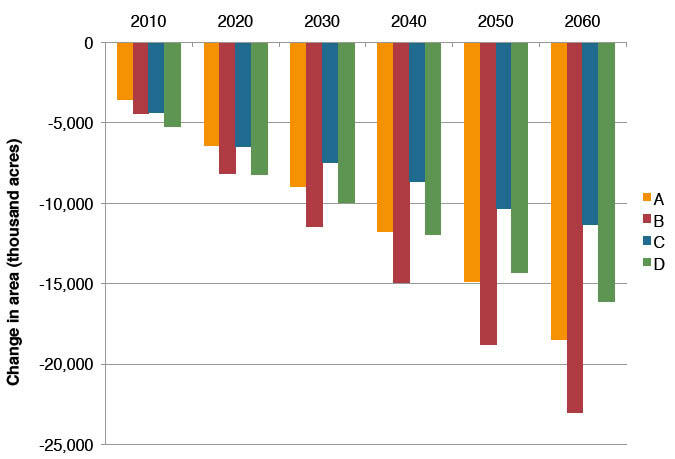 Figure 4.16—Percentage change in cropland uses, 1997 to 2060, based on an expectation of moderate urbanization gains with decreasing timber prices (Cornerstone D). 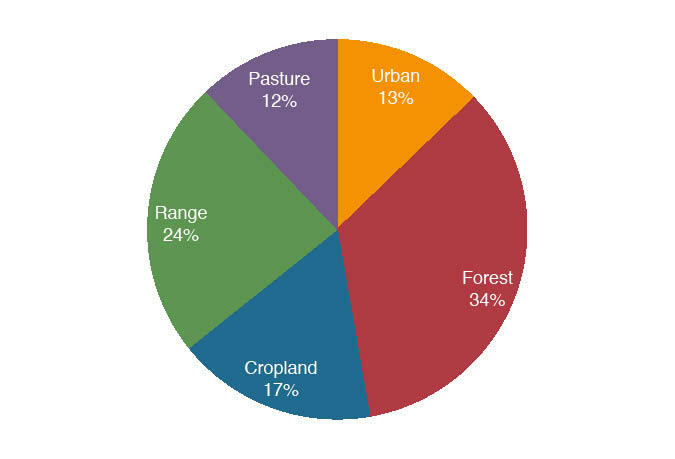 Figure 4.17—Percentage change in cropland uses, 1997 to 2060, based on an expectation of large urbanization gains with increasing timber prices (Cornerstone A). 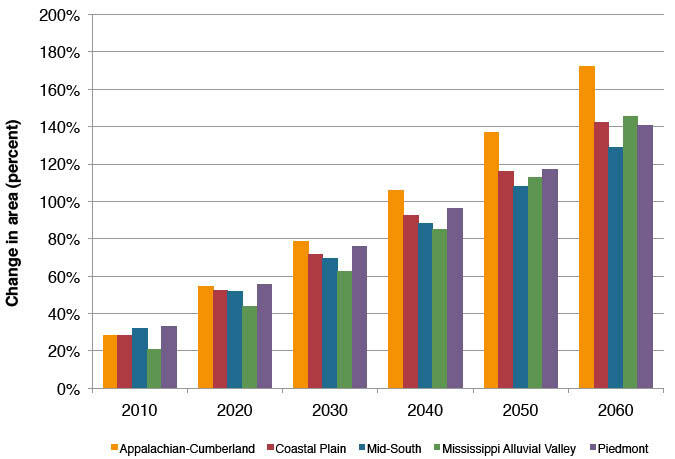 Figure 4.18—Cumulative change in cropland area by southern subregion from 1997 to 2060 by decade, expressed in (A) acres and (B) percent; based on an expectation of large urbanization gains with decreasing timber prices (Cornerstone B). 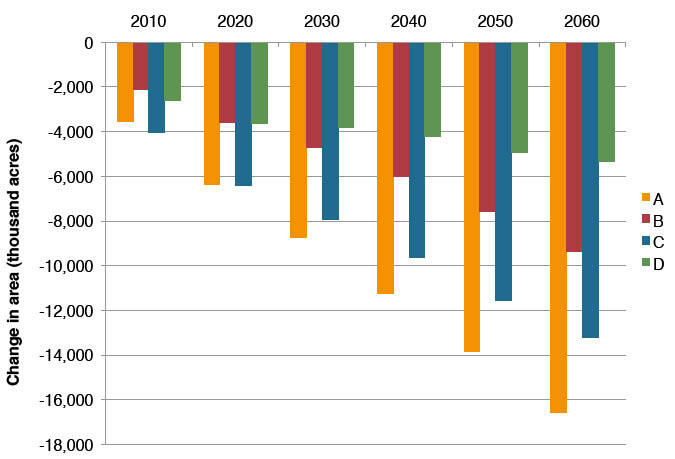 Figure 4.19—Percentage change in cropland uses, 1997 to 2060, based on an expectation of moderate urbanization gains with increasing timber prices (Cornerstone C). Figure 4.20—Cumulative change in pasture land uses by southern subregion from 1997 to 2060 by decade, expressed in (A) large urbanization gains with increasing timber prices, (B) large urbanization gains with decreasing timber prices, (C) moderate urbanization gains with increasing timber prices, and (D) moderate urbanization gains with decreasing timber prices. Figure 4.21—Percentage change in pasture land uses, 1997 to 2060, based on an expectation of large urbanization gains and decreasing timber prices (Cornerstone B). 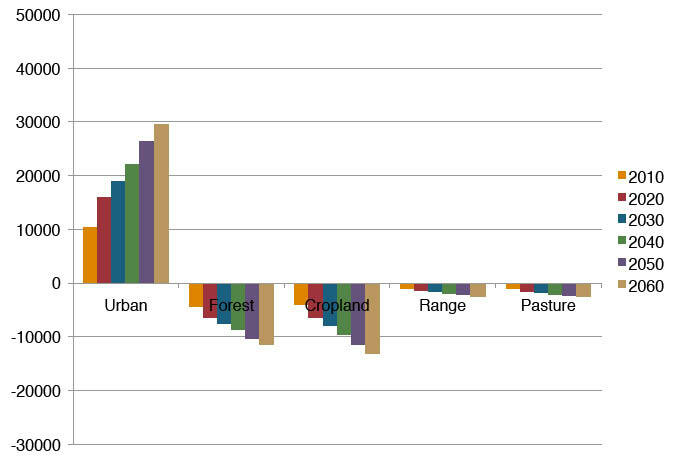 Figure 4.22—Cumulative change in pasture area by southern subregion from 1997 to 2060 by decade, expressed in (A) acres and (B) percent; based on an expectation of large urbanization gains with decreasing timber prices (Cornerstone B). 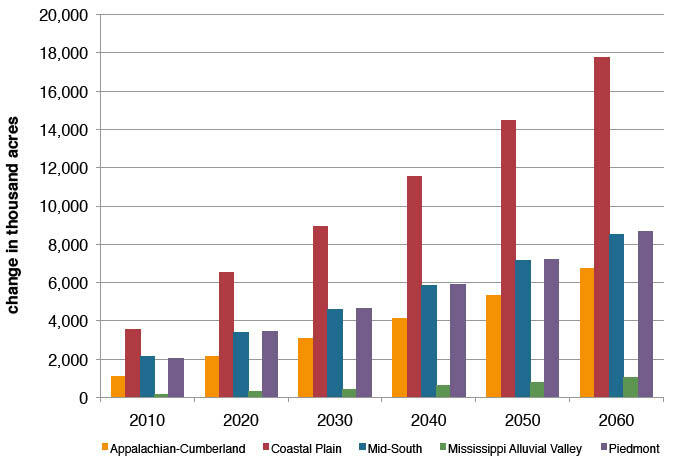 Forecasts of population and income growth point toward an expanding area of developed uses in the South. All Cornerstone Futures considered here lead to at least a doubling of urban area by 2060 and predict strong growth in urban uses from 1997 to 2010. We chose 1997 as the base year for applying county-level models because the 1997 survey of land uses was the most recent source of comprehensive data at the time of our analysis. Subsequently, State-level land use data (USDA 2009) have become available, and they provide some confirmations of our forecasts. They show a 24 percent increase in developed land uses from 1997 to 2007 in the 13 Southern States, slightly less than the 29 percent forecasted for 1997 to 2010 by our models. This confirms that the modeled relationship between population/income growth and the demand for urban land has held up over the past decade and supports the use of our models for forecasting future growth. Between 30 and 43 million acres of land in the South are forecasted to be developed for urban uses by 2060 from a base of 30 million acres in 1997. This doubling of urban land uses defines a general challenge to the sustainability of southern forests, especially in areas where population growth is likely to be concentrated. Urban growth is forecasted to be especially high in much of the Piedmont (continuing into portions of the Southern Appalachians that form the western borders of the Carolinas), the urban areas of Texas, and Peninsular Florida. Urbanization is forecasted to produce declines in all rural uses of land over the next 50 years. Forest area, which is currently the largest land use in the South, is forecasted to decline by the largest amount—between 11 million acres (7 percent) and 23 million acres (13 percent)—for all Cornerstone Futures, with forecasted losses varying to reflect the effects of economic growth (storylines) and market futures for timber products. All subregions are expected to lose at least some forest acreage under all Cornerstone Futures, and nearly all of this area is expected to be converted to urban uses. The forecasts indicate that strong future timber markets could ameliorate forest losses somewhat, but this comes at the expense of cropland uses. Urbanization as well as forest losses are not spread evenly across the region. Rather there are subregions and sections with disproportionately high forecasted losses. Among the subregions, the Piedmont is forecasted to lose the greatest proportion of its forest area: 21 percent under the highest-loss Cornerstone. The Mid-South and Mississippi Alluvial Valley are forecasted to lose the least percent of forest area (between 8 and 9 percent). Urbanization is forecasted to reduce the area of cropland in the South at a rate that is proportionally greater than for forests. This is due to spatial distribution of anticipated population and income changes—i.e., focused in areas with existing agricultural production—but also is affected by the relative returns to agricultural and timber products. Range and pasture losses also decline, but not as much as cropland and forest land. 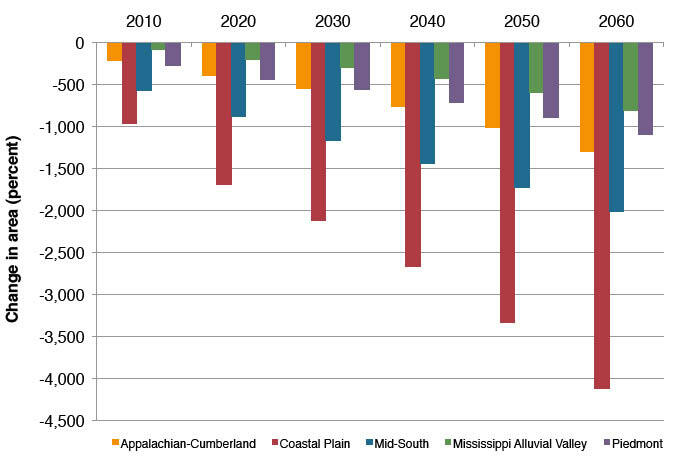 Overall, the area of cropland in the South is forecasted to decline by as much as 17 million acres by 2060 from a 1997 base of about 84 million acres. 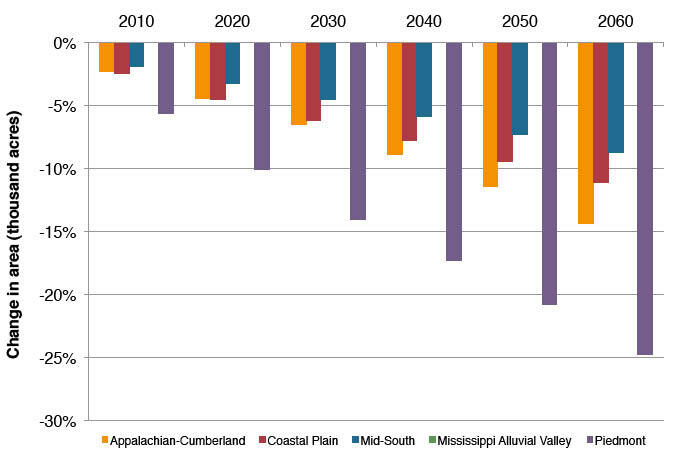 Cropland losses would be highest in North Carolina, southern Florida, and central Texas. Figure 4.23—Cumulative change in rangeland uses by southern subregion from 1997 to 2060 by decade, expressed in (A) large urbanization gains with increasing timber prices, (B) large urbanization gains with decreasing timber prices, (C) moderate urbanization gains with increasing timber prices, and (D) moderate urbanization gains with decreasing timber prices. Figure 4.24—Percentage change in rangeland land uses, 1997 to 2060, based on an expectation of large urbanization gains and decreasing timber prices (Cornerstone B). The land use forecasts developed for this chapter are consistent with a modeling framework applied to the National Resources Inventory land use data set and forecasts of several exogenous variables. The model’s strength derives from its explicit connection to the broader framework of the U.S. Forest Assessment System—it is designed to be driven by the key RPA variables. As with any forecasting model, its limitations have to do with the range of data upon which it is based—that is, the time period addressed by the land use inventory data—and also by the accuracy of the forecasts of exogenous variables. The model used for our analysis is especially dependent on the spatially explicit RPA forecasts of population and income. Future models may be enhanced with more frequent data on observed land uses, and also by the development of new methods for the combined forecasting of population change, economic development, and land use choices. change on terrestrial carbon dynamics in the Southern United States. Journal of Environmental Quality. 35: 1533-1547. Hardie, I.; Parks, P.; Gottleib, P.; Wear, D.N. 2000. Responsiveness of rural and urban land uses to land rent determinants in the U.S. South. Land Economics. 76: 659-673. Lubowski, R.N. ; Plantinga, A.J. ; Stavins, R.N. 2006. Land-use change and carbon sinks: econometric estimation of the carbon sequestration supply function. Journal of Environmental Economics and Management. 51: 135-152. Lubowski, R.N. ; Plantinga, A.J. ; Stavins, R.N. 2008. What drives land-use change in the United States? A national analysis of landowner decisions. Land Economics. 84: 529-550. U.S. Department of Agriculture (USDA) Forest Service. 2012. Future scenarios: a technical document supporting the Forest Service 2010 RPA assessment. Gen. Tech. Rep. RMRS-GTR-272. Fort Collins, CO: U.S. Department of Agriculture, Forest Service, Rocky Mountain Research Station. 34 p.
U.S. Department of Agriculture (USDA). 2009. Summary report: 2007 national resources inventory. Washington, DC: Natural Resources Conservation Service and Center for Survey Statistics and Methodology. Ames, IA: Iowa State University. 123 p. http://www.nrcs.usda.gov/Internet/FSE_DOCUMENTS//stelprdb1041379.pdf. [Date accessed: January 24, 2012]. Wear, D.N. 2002. Land use. In: Wear, D.N. ; Greis, J.G., eds. Southern Forest Resource Assessment. Gen. Tech. Rep. SRS-53. Asheville, NC: U.S. Department of Agriculture Forest Service, Southern Research Station: 153-173. Woods and Poole Economics. 2007. Complete economic and demographic data source (CEDDS) technical documentation. Washington, DC: Woods and Poole Economics Inc. 101 p.
This appendix provides documentation of the land use models used to generate forecasts for this report. Wear (2011) provides details on this modeling approach. We model changes in land use as a function of independent variables defined by the RPA scenarios. Population and income projections, downscaled to counties for each scenario, drive our forecasts of land development activities. A theoretically complete analysis of urbanization would jointly address the mechanics of land supply and demand to determine both development values and land in developed uses (e.g., Lubowski and others 2008). By taking RPA population and income forecasts as givens, we are adopting an implicit spatial economic growth solution. As such, the modeling task is to define the response of land use allocations to the population and income forecasts from the scenario framework. We model changes in the area of land within a county for a small complement of land use classes in response to these and other variables. Variation in historical land allocations reflects differences in the demand for various goods and services derived from land as well as a number of supply factors, such as soil characteristics and climate that define comparative advantage for producing these goods and services. In a qualitative sense we follow the approach of Hardie and others (2000) by adopting a model that is a synthesis of the von Thunen concept of developed land use organized by steep rent gradients around central business districts and Ricardo’s model of rural land use allocation based on rents accruing to competing rural uses (Lubowski and others 2006). More to the point, we assume that demand for urban uses follows some pattern of spatial contagion (defined relative to a single or multiple growth poles) and that rents associated with new urban uses supersede rents for all rural land uses—a near vertical rent gradient for the urban use in von Thunen’s model. Our modeling approach differs from previous efforts (e.g., Lubowski and others 2008, Hardie and others 2000) in some important ways. These previous models focus on testing hypotheses regarding land use distributions (e.g., interacting Ricardian and von Thunen specifications, Hardie and others 2000) and conducting counterfactual simulations regarding policy effects on land use distributions (e.g., for carbon policies, Lubowski and others 2006). Explaining the existing distribution of land uses requires extensive data that account for differences in productivity, including climate, soil, and topographic variables. We focus here on forecasting change in land use conditioned on the current distribution of land uses and based on forecasts of a much smaller set of exogenous variables. For each county in the forested area of the South (excluding central and western Texas and Oklahoma), we model the urbanization process and changes in four rural uses: forest, crops, range, and pasture. The data set used for model estimations is a panel of observed land uses in two years (1987 and 1997), the most recent comprehensive data set available for our use derived from the NRI land use inventory. Models were applied to what we define as the variable or mutable land base: non-Federal land classified as developed, crops, pasture, range, or forests. All other land in the county was held fixed in its current use. We adopted a two-stage modeling approach which first defines urban-rural allocations and then allocation for four rural land uses. Differencing causes observed and unobserved fixed attributes of the county to fall out of the change equation (see Wooldridge 2002). Change therefore relies strictly on time-varying variables that are forecast to change between periods. Other time-varying variables such as rents accruing to crop or timber uses are excluded from this model by assumption—i.e., that urban rents completely dominate all other rural rents in the area of the county affected by the shift in demand. We posit that this urban growth difference equation may differ across subregions of the United States, due in part to the effects of topography and climate on the spatial agglomeration of uses (e.g., mountainous areas and flat areas may reveal different development patterns determined in part by topographic features). We therefore estimated separate models for broad regions and within each regional model we allowed for differences in coefficients by ecological provinces (Rudis 1999) by interacting dummy variables for the ecological provinces with each independent variable. We estimated equations 3, 5.1 and 5.2 using a weighted Seemingly Unrelated Estimation approach to account for cross equation correlations. Coefficient estimates are described in Wear (2011). For areas in central and western Texas and Oklahoma, we use a model developed for the Rocky Mountain region. This model requires that we address changes in rangeland and uses the same structure for predicting urbanization. 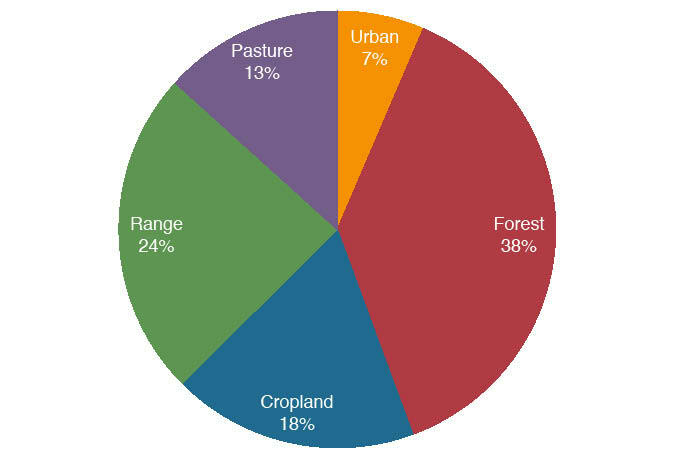 However, a simpler model is applied to rural land use changes where forest, crop, range and pasture uses are forecasted to change in response to urbanization with proportional change determined by the existing proportion of each rural land use (see Wear 2011). Forecasting Algorithm—Our models are designed to forecast change in the areas of urban, forest, and crop uses with pasture use as a residual. Because areas in any land use are not constrained to be positive by the structure of these equations, nonnegativity constraints and “adding-up” rules need to be applied to ensure logical forecasts. We forecast change in land use in response to the driving variables of each scenario, including population, personal income, and relative timber prices (indexed by the price of softwood pulpwood). David N. Wear is the Project Leader, Center for Integrated Forest Science, Southern Research Station, U.S. Department of Agriculture Forest Service, Raleigh, NC 27695. The Southern Forest Futures Project uses six Cornerstone Futures (labeled with letters A to F) to provide alternative scenarios about the future of several exogenous variables. 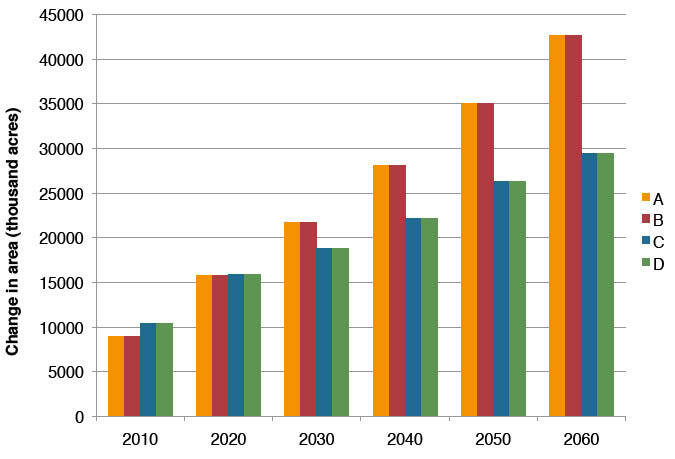 These are based on projections of county-level population, income, and emissions-driven climate changes that were developed for the national assessment conducted by the Forest Service, U.S. Department of Agriculture, in accordance with the Resources Planning Act (RPA) and findings by the Intergovernmental Panel on Climate Change, with assumptions added about future timber scarcity and tree planting rates (chapter 2). Two RPA storylines, labeled A1B and B2, are used for the Cornerstone Futures. B2 provides a lower rate of population growth (a 40 percent increase from 2010 to 2060) and A1B provides a somewhat higher rate of growth (60 percent). Income growth is also higher with A1B. Both of these storylines are connected to detailed global economic/demographic scenarios (USDA Forest Service 2012). Timber price futures address increasing or decreasing scarcity, with real prices progressing at an orderly rate of 1 percent per year from the 2005 base through 2060. We also hold the real returns to agricultural crops constant throughout the forecasts. Another element of the storylines embedded in these Cornerstone Futures is the climate forecasting derived from the application of general circulation models to the assumptions of the storylines. 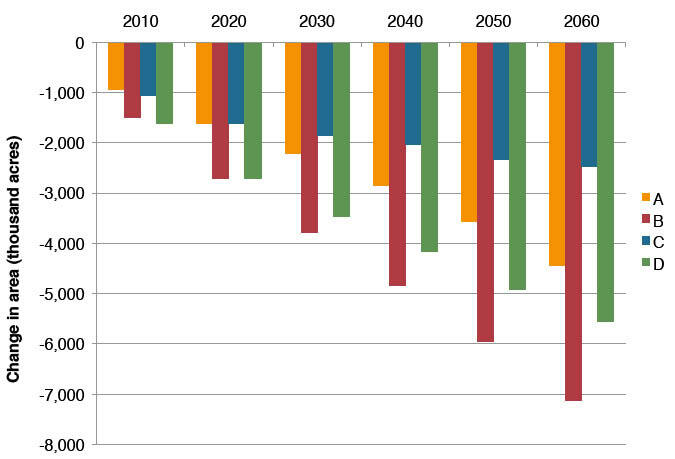 However, these climate forecasts do not influence land use changes as modeled here. The six Cornerstone Futures are displayed below in a diagram that emphasizes their key variables. Cornerstones A through D are defined by the matrix formed by intersecting storylines A1B and B2 with increasing and decreasing timber price futures. Although some new forests may be established through the land use model (afforestation), more substantial forest-type changes are likely to accrue in response to management choices (reforestation). These four Cornerstones use historical tree planting rates following harvests (by State and forest type) to forecast future planting. Two additional alternatives depart from these four either by increasing planting rates for Cornerstone A to produce Cornerstone E, or by decreasing planting rates for Cornerstone D to produce Cornerstone F (chapters 2 and 5).